More photos from Chuck Chase, call sign Shotgun 24, from his tour as an Army FAC in Vietnam. These will give those who haven’t been there some idea of the conditions under which Birddog crews were living and flying in. These photos were submitted by Chuck Chase, call sign Shotgun 24. 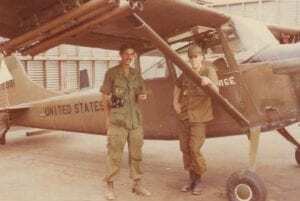 Chuck was a Sector pilot in the 221st RAC assigned to fly tfor Sadec Province and ph Quoc Special Province. Chuck flew more than 800 hours in the year he served in Vietnam. Chuck commented that the plane he flew in Vietnam was not quite as nice looking as the Birddogs that were present at the 221st RACreunion at CannonField in San Antonio. He stated that his Birddog had a numbefr of shades of OD paint unlike the planes participating in the reunion. Chuck said htat to see the planes fly again took him back 40 years. You will enjoy these photos as they are very unique and give a very clear view of what the Birddog cockpit was like in a combat situation. We will always owe a debt of gratitude to thei great airplane. We must remember that of the hundreds if not thousands of Birddogs that flew combat missions in Vietnam, only a very few returned home.